An Absolute Winner – Pork Bun Cha! There’s not much I can say about this recipe, other than the fact it is AWESOME! Take a look at the ratings Paul and I give this dish, and you’ll see what I mean! I looked online and found this recipe here. I had no expectations of what this recipe would turn out like – all I knew is that it’s low calorie, low in fat and full of healthy green things. Given I’m trying to kick start myself to get ‘summer body ready’ (given the current weather, I’mn not sure why I’m bothering though), I just wanted something tasty. And goodness me is this tasty. It’s also the softest, tenderest pork I’ve ever cooked, and I’m notoriously bad at accidentally over-cooking pork. The way I’d describe this dish is a warm layered noodle salad. With a kickass sauce that’s packed full of flavour and heat. (Go easy when you pour it over at the end, otherwise you’ll set your face on fire). The bottom layer is cooked rice vermicelli noodles, middle layer is fresh veg and the top layer is the marinated pork. Top off with the fire sauce. Given that I love Vietnamese and Thai food, I had practically all the ingredients in the cupboard anyway so strangely it’s quite a ‘cupboard staple’ recipe that I am certainly going to do again. The only thing to get is fresh mint and coriander. Finally, it’s worth noting that whilst this is a recipe for 2 people, there was a lot of sauce left over. I’m quite happy with that as I’ll no doubt use it up soon re-making this dish or a slight variation of it. But you may want to consider halving the sauce recipe if you don’t intend to use it up somehow. Fresh, zingy and virtuous – what’s not to love?! Place the lemongrass, lime leaves, garlic, turmeric, sugar and fish sauce into a mixing bowl and mix together. Rub the pork with the mixture and leave to marinade for 30 mins. To make the sauce, combine the garlic, chilli and sugar in a mortar or food processor and pound to a fine paste. Add the lime juice, vinegar, fish sauce and 50 ml water and stir to blend. Put the noodles in a bowl with boiling water to cover. Let stand until al dente – around 10 mins. Divide the noodles between 2 bowls. Mix the salad ingredients together (apart from the herbs) and top each bowl of noodles with salad. Heat the oil in a griddle on high until it is almost smoking. Throw on the pork and grill for 3 mins or so until the meat has charred nicely and is just cooked through. Top each bowl with the pork. Finish by topping each bowl with the herbs and serve with a few tablespoons of the sauce poured over. Leave the rest on the table for people to flavour to their taste. 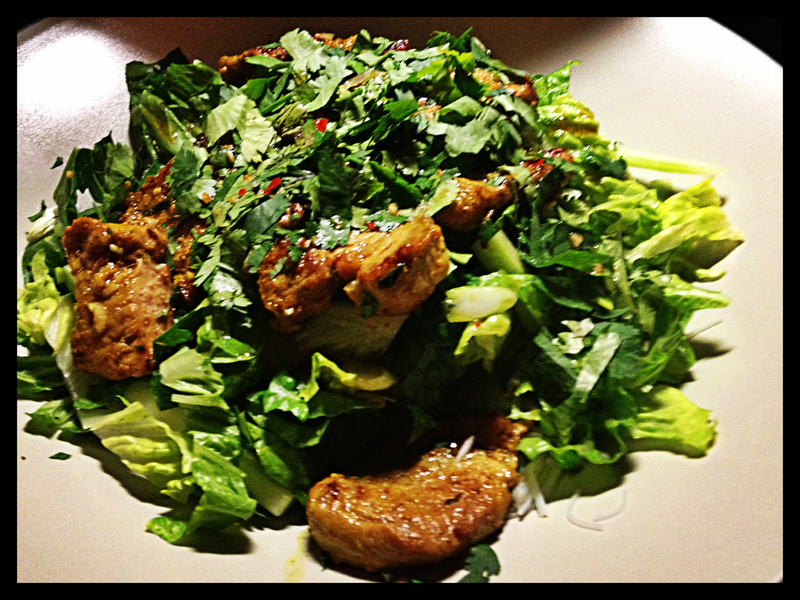 Categories: Pig, Reidbury Recipes | Tags: low calorie, Pork, Vietnamese | Permalink. I give it a rating of 8, probably higher if I didn’t have a monstrous hangover. Good recommendation Katie B!